Barrie Colts 2018 NHL Draft Prospects: Andrei Svechnikov. #OHL #NHLdraft - Very Barrie Colts | A website covering the Barrie Colts of the OHL. Andrei Svechnikov finished the season ranked as the top North American draft eligible skater by NHL Central Scouting. Most expert mock drafts have him going 2nd overall, followed by Swedish defenceman Rasmus Dahlin. Dahlin is an exceptional player, and expected to be a franchise defenceman for the Buffalo Sabres. The Sabres are expected to run to the podium and take Dahlin first overall. NHL teams are starving for quality defenceman and Dahlin is an absolute stud. Therefore, Dahlin has solidified his status by most experts as the top prospect available. Svechnikov won the Rookie of the Year award at the completion of the 2017-18 OHL season. He ended the season scoring 40 goals and added 32 assists in just 44 regular season games. His goals per game played were the best in the OHL. Svechnikov's numbers were limited after missing some time with a broken hand, attending the World Juniors, and a suspension late in the season. His statistics could have been ridiculous if he didn't miss so much time. If that were the case, the gap between him and Dahlin would be much smaller than most people think. Offensively, Svechnikov is as dominant as they come. His ability to see the ice and make plays is special to watch. Many scouts describe him as a goal scorer, which is true but that doesn't shed light on his play making abilities. Svechnikov took down several nods in the 2017-18 OHL Coach's Poll. He was ranked first in Best Skater and second in Best Shot. He crushed the competition in the weave agility drill with and without the puck at the CHL Top Prospects game on-ice testing. Therefore, pretty much all the main skills of a top offensive dynamo are there. Another area of Svechnikov's game that is overlooked at times is his ability in his own end. Maybe it is because of how offensively sound he is, but Andrei always did a great job of getting back in his zone to help out defensively. Not only did he help bail out the Colts back checking; but opposing players would rush to move the puck knowing that Svechnikov would make heavy contact. The 6'3, 187lb Russian is a big hitter. His creativity, shot and size make him a strong candidate to play in the NHL next season. In fact, Barrie Colts management expects him to play in the NHL next season. Check out a link to an interview done by Jason Ford (Colts GM) about Svechnikov HERE. 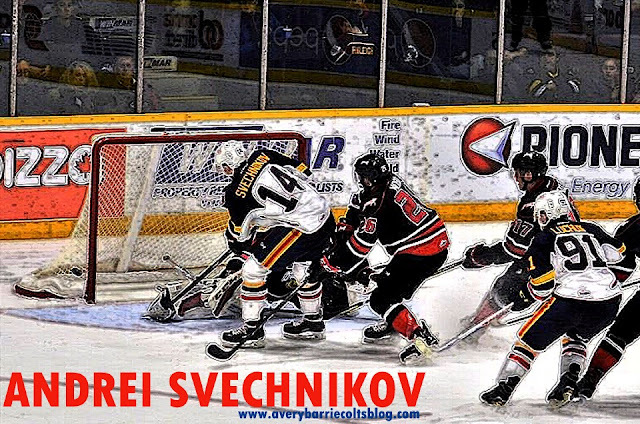 Forward @ASvechnikov14 of @OHLHockey's @OHLBarrieColts is the top ranked skater by @NHLCentralScout and plays the game with speed and high end offensive instincts. Before being drafted 1st overall by the Colts in the 2017 CHL Import Draft, Svechnikov played with the Muskegon Lumberjacks of the USHL. In the regular season, he posted 29 goals and 29 assists in 48 games played. Despite being eliminated in the 1st round of the Clark Cup Playoffs, Svechnikov was named to the All-Rookie team, First All-Star team, and took USHL Rookie of the Year honors. Svechnikov's older brother, Evgeny Svechnikov, plays for the Detroit Red Wings. He was selected by the Wings 19th overall in 2015. He spent most of last season playing with the Wings AHL affiliate, the Grand Rapids Griffins.